These cycles of experience, of course, all stem from that worm-riddled book. I remember when I found it - in a dimly lighted place near the black, oily river where the mists always swirl. Bookhounds of London is a brand new campaign setting for Trail of Cthulhu, packed with period detail, where the Investigators seek out books about horror and strangeness and become, seemingly inevitably, drawn into the horror themselves. It provides in depth material on London in the 1930s, carefully slanted towards Mythos investigators. Bookhounds' London is a city of cinemas, electric lights, global power and the height of fashion. It's about the horrors - the cancers - that lurk in the capital, in the very beating heart of human civilization. A Templar altar might well crouch, mostly forgotten, in the dreary Hackney Marshes, but altars to false gods tower over the metaphorical swamps of Fleet Street and Whitehall. And as for lost, prehuman ruins... who's to say what lies under London, if you dig deep enough? The PCs aren't stalwart G-men or tweedy scholars exploring forbidden frontiers. Instead, they acquire maps (and maybe guidebooks) to those forbidden frontiers from fusty libraries and prestigious auction houses. They are Book-Hounds, looking for profit in mouldy vellum and leather bindings, balancing their own books by finding first editions for Satanists and would-be sorcerers. They may not quite know what they traffic in, or they may know rather better than their clientele, but needs must when the bills come in. 32 authentic full-colour maps with unique new street index of London in the 1930s, and plans of major buildings. A Mythos take on London in the 1930s, packed with contacts, locations and rumours. Whitechapel Black-Letter, a brand new adventure which takes Bookhounds through the bleak East End of London on the trail of a powerful 15th century grimoire. 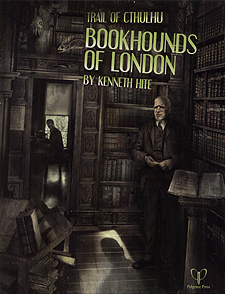 With Bookhounds, Kenneth Hite creates a rich sandbox full of dusty tomes, crooked dealers and dark alleys, a perfect setting for any Mythos investigation.